During the 1988 Christmas season, the Koosh ball was the hottest toy on the shelves. The Koosh ball was a rubber ball filled with a jelly-like plasma and its outside consisted of hundreds of rubber spikes making it look like a soft and flexible porcupine that did not hurt to hold or squeeze. When someone sqeezed the object, the plasma caused it to squirm around in his hand while the spikes provided something to grip in one’s hand. 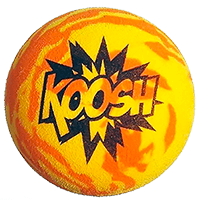 The koosh ball was developed by Scott Stillinger and Matt Button, the owners of Oddz On Products. The toys had great appeal with a suprising number of adult fans. It was estimated that 40% of the toys were purchased for adults to play with. Several million units were shipped from the next four years and were supported by an official user’s guide “The Official Koosh Ball.” While the number of units sold has dropped off, they are still a holiday favorite.